US department store chain Macy's is to cut 2,300 jobs, a move announced as it unveiled a decline in sales in January. The company is removing the management positions as it shuts three regional offices to reduce costs. During January Macy's saw same-store sales, which excludes new store openings, fall 7.1% from a year before. The decline in sales was worse than the 5.9% drop expected by retail analysts. Macy's first warned last summer that it was struggling against weak sales. Macy's said its new streamlined regional structure, which will see the closure of its Minneapolis, St Louis and Seattle offices, will reduce its annual costs by about $60m this year, rising to $100m from 2009. Chief executive Terry Lundgren said the move would "get us back to the place where we can take market share and grow our sales". However, retail analyst Dan Hess of Merchant Forecast warned that the changes were "going to create turmoil" in the short term. 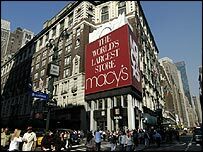 Mr Hess added that the fear was that Macy's would experience missed deliveries and other mistakes until it had time to adapt to the changes.